When twins are poorly, use Cbeebies! Jasmine is still poorly today, and Thomas also seems to be coming down with something now as well. Both have had high temperatures and Jasmine spent a few hours in bed this afternoon drifting in and out of sleep. It seems to have done her the world of good though as she managed to eat more at dinner this evening than she has done in all her meals put together since Thursday! So today we’ve had moments of quiet alongside moments of wanting stuff to do today. 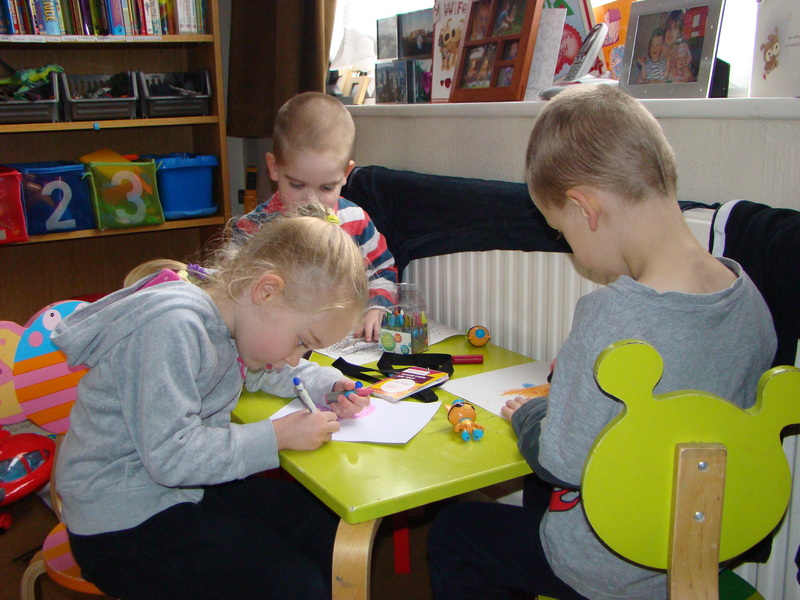 This morning I wandered into the living room to find all 3 kids sitting at the table drawing really nicely together. They were all drawing Kwazii from The Octonauts! They have been asking to make this Kwazii puppet since they saw it on CBeebies a few days ago and because it is a craft that can be done a bit at a time it was perfect for today. We painted the paper plates this morning and then gradually throughout the day all 3 kids finished their puppet. They are all very pleased with their finished puppet, and of course now they want Peso and Captain Barnacles puppets as well! Luckily we have plenty of paper plates!